As the month of October begins, so begins the Albuquerque International Balloon Fiesta. For nine days the desert skies of New Mexico will be painted with over 700 hot air balloons. From giant multicolored balloons to fun and original shaped, there are always plenty of sights to be seen. New Mexico is known today for hosting this fun and exciting event every year. As the crisp fall air blows these gentle giants across the New Mexico sky, hearts are warmed by the fun times this annual festival brings. From all across the globe, balloon enthusiasts come to experience the Albuquerque International Balloon Fiesta. This fun festival has become the most photographed event in the world. 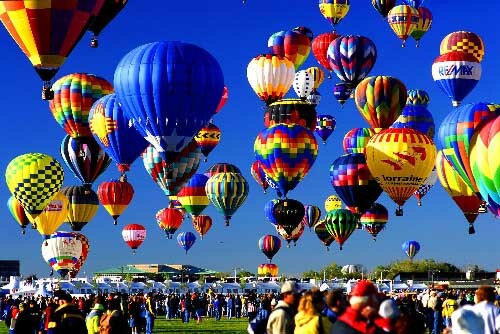 Since its origin in 1972, the Albuquerque International Balloon Fiesta has grown from 17 balloons to over 700! The Albuquerque International Balloon Fiesta is now the largest international event in the USA! The balloons launch into the blue to decorate the 365-acre Balloon Fiesta Park. The roar of hundreds of burners firing up at once raises the excitement as the giant balloons quietly float into the sky. The amount of fun can only be matched by the amount of balloons the decorate New Mexico’s azure heavens. If you are looking for a fun thing to do in New Mexico, look no further than the Albuquerque International Balloon Fiesta. With so much fun around every corner, the only downfall is that it only happens once a year. So bring the whole family out for a fun fall vacation to New Mexico.